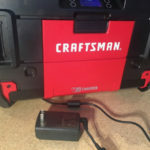 The Craftsman VersaStack Connect Radio and Charger contains a great deal of power in a unique design. 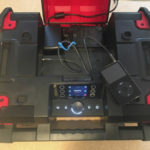 The Connect Radio sounds fantastic, it allows for multiple audio sources, and it is durable enough for most job sites. I would highly recommend it for those that demand quality audio on the job and at home. 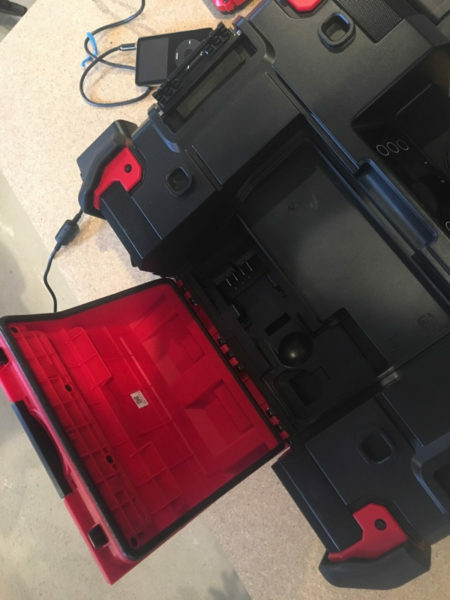 When I originally unboxed the Craftsman VersaStack Connect Radio and Charger, it looked more like a drill case than a radio. 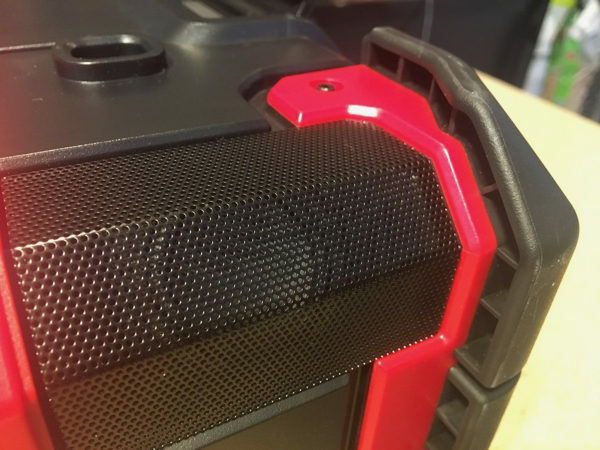 The Connect Radio is heavy (13.2 pounds) and obviously designed to be durable. The large plastic handle was rubberized for a sure grip. 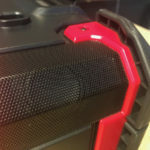 Each of the 4 corners had 4” x 3” pieces of rubberized plastic to cushion and protect the unit from falls. 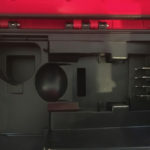 Additionally, these bulky corners raised the unit 0.5” off the ground when the Radio was placed standing up, which would certainly protect it from any spills or debris on the ground. 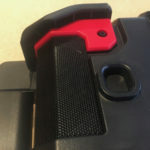 On the bottom of the unit there are 4 feet that raise the unit 0.75” off the ground when laid down flat, or the feet can be used to stack the Connect Radio on top of other Craftsman VersaStack products. 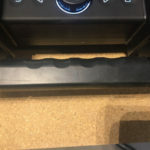 The Connect Radio also has an IP54 rating for weather and dust resistance. 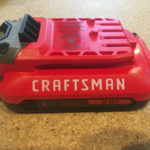 Based on the rugged design of the case, I imagine Craftsman wanted users of the VersaStack Connect Radio to be confident it would be safe and well protected amidst saw dust and water spills. 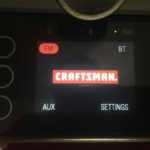 While the Craftsman VersaStack Connect Radio may have been built for durability, don’t underestimate its ability to beautifully reproduce music. I was thoroughly impressed from the first time I turned on the Connect Radio. The radio boasts 4 full-range speakers, 1 active subwoofer, and 1 assisted bass resonator. 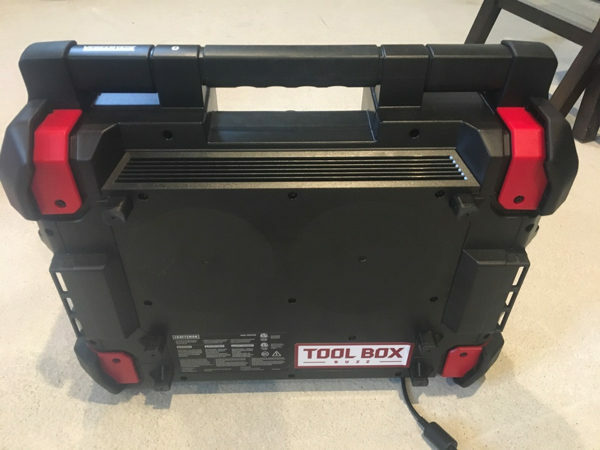 With 40 watts of power, the Connect Radio filled my entire basement workshop with high quality audio, and it could easily be heard on the second floor when I raised the volume to just over 60%. I played a variety of music genres and the Connect Radio reproduced the highs and lows really well, and there was a lot of bass, too. When I played the “Greatest Hits” album by Queen, the vocals were crisp, the instruments were robust, and the bass shook my entire desk. I was totally impressed by the audio produced by the Connect Radio. 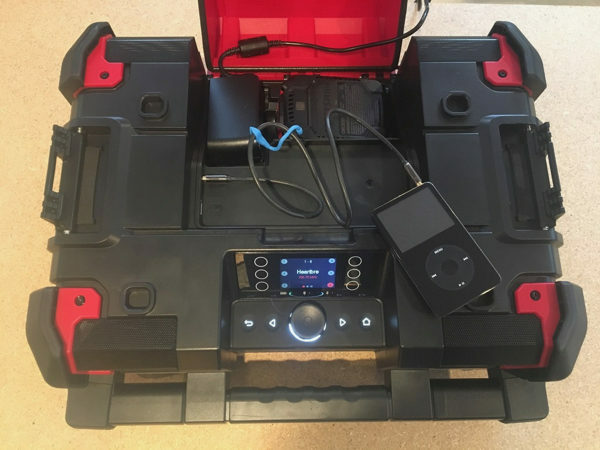 The Connect Radio has several high-end features that you might not expect for a radio designed for the job site. To start, the FM antenna is internal so there is no risk of breaking it. The antenna picked up all of the local Boston and Worcester stations that I expected it to with almost no static, even in my basement. The power/volume button is 1.25” in diameter and very easy to manipulate. After depressing the power button, the Connect Radio operation screen powers on and after about 8 seconds, it returns to the last audio source that was used. 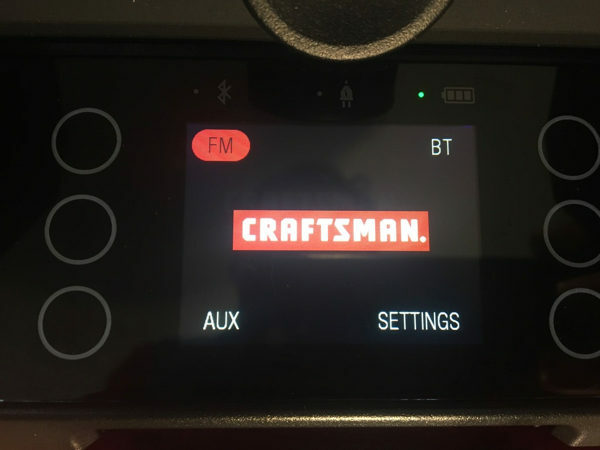 Craftsman designed an impressive full-color screen to operate the radio. This screen is touch sensitive and it flips orientations based on how the radio itself is oriented—it was very impressive watching the screen change directions when I moved the radio from standing upright to lying down. When using the FM radio as the source, the screen indicates the radio frequency, the artist, and the name of the song. 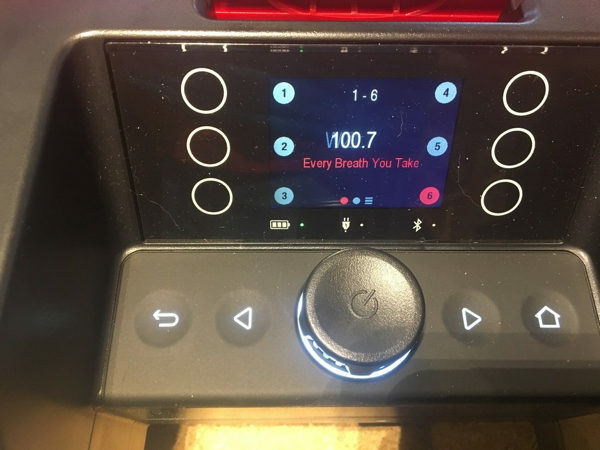 Around the full color screen are 6 buttons that can be used to save 12 different radio stations. 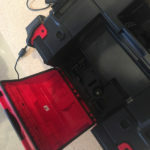 The screen also indicates the power source and if Bluetooth is currently connected. Surrounding the power/volume button are 4 more buttons. The Back button brings you back a screen. 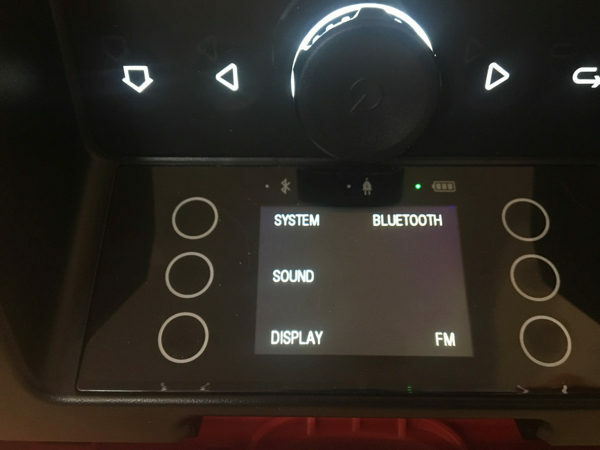 The Home button includes icons for selecting the audio source—FM, Bluetooth, AUX—and a Settings button accesses menus for sound, display brightness, Bluetooth, and FM tuning. 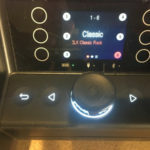 Finally, the Left and Right arrow buttons allow you to move between channels 1-6 and 7-12, as well as advance songs when connected to a device via Bluetooth. Craftsman included so many features in their touch-screen menu that I had to read through the manual to understand them all. I am not sure there are many work site radios this complex, which certainly attests to the quality workmanship. 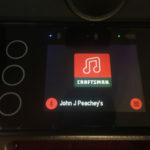 The Connect Radio allows you to interact with it through the free Craftsman Radio App available for Android and iOS. The App was an easy download to my iPhone and I connected to the radio with Bluetooth in less than 15 seconds. 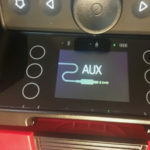 On the touch-screen of the Connect Radio, it displays the name of the device connected to it, as well as any audio that is playing. The App gives the user so many options to control the Connect Radio. 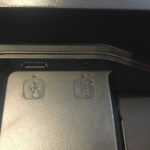 On the main screen of the App are buttons to access the User Guide, power on and off the Connect Radio, and an icon that displays the battery strength. You can adjust the volume with a slider, as well as quickly mute the Radio with the push of a button. The FM Radio button on the App displays all 12 presets, and it will allow you to scan for additional radio stations, too. The Library button displayed all of the Songs, Artists, Albums, and Playlists that I had previously purchased from within my App Store account. I was impressed that the Connect Radio accessed all of my purchased music, not just the songs I downloaded to the Music App on my iPhone. When set to Songs, the App will play all of the individual songs you have purchased in alphabetical order, or you can choose Shuffle. Inside the Songs and Artists options there was a helpful Search function. 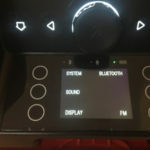 The Settings button is where you can connect and disconnect Bluetooth devices, as well as update the Connect Radio’s firmware. I keep my iPhone in my pocket most of the time, so having such a comprehensive App available to me was a real advantage, especially because I could play anything from my App Store account. 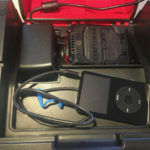 In terms of Bluetooth connectivity, I was able to walk around my entire 2-story house with my iPhone and never lost connection to the radio. 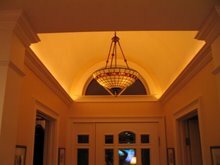 The Connect Radio was on the first floor and I was able to be in the basement and second floor of my house without any issues. 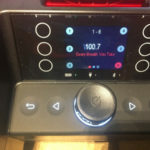 Since the Connect Radio offers Bluetooth connectivity, you can also stream music to it from Pandora and Spotify—another attractive feature, in my opinion. 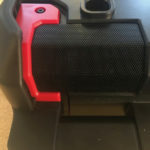 The manual didn’t specify the Bluetooth range, but in all of my testing, the Connect Radio was flawless and well exceeded the 30-foot range that most Bluetooth speakers have. 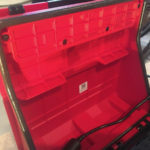 Behind the red plastic latched door on the front of the Connect Radio, there is a large storage compartment that serves many purposes. The entire underside of the storage compartment door has a weather seal to keep out dust and water. 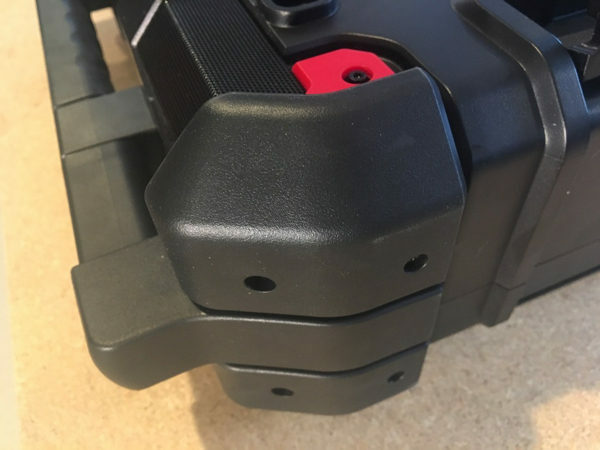 The storage compartment is designed to simultaneously hold the 20V battery and the AC adapter. 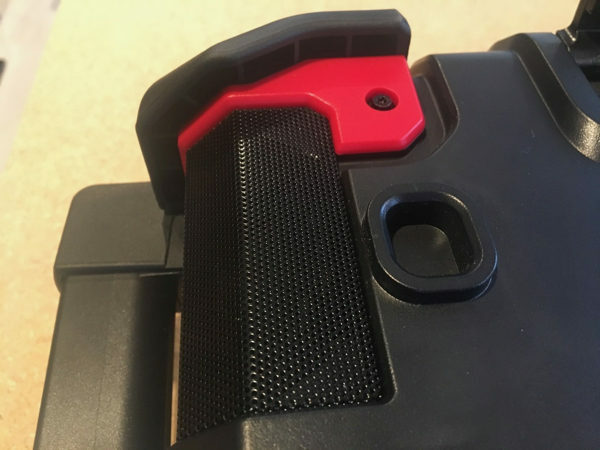 There is an upper shelf to hold your iPhone if you prefer to keep it protected inside the radio. My iPhone 6S fit with plenty of extra space. 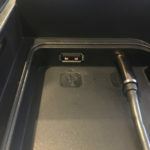 When the iPhone is inside the compartment, you can charge it with the included USB charging outlet (5V/2.1A); this was a very convenient feature to have. 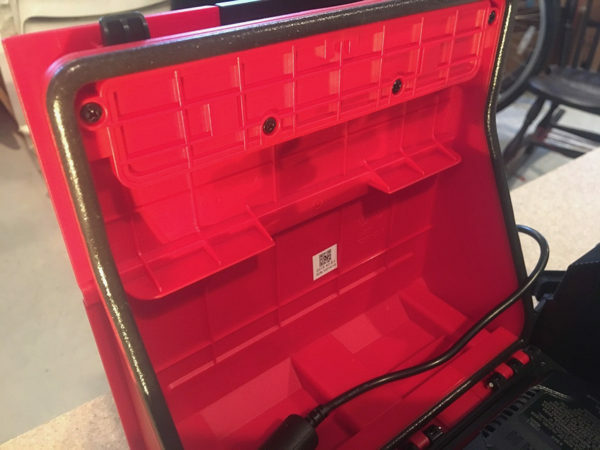 Craftsman also included a 3.5mm Auxillary port inside the storage compartment that worked fantastically for playing music from my older generation iPod Classic and iPod Nano. You will need to provide your own USB cord and AUX cord. I think the storage compartment was perfectly designed for utility and convenience. 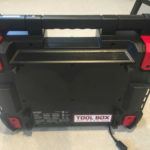 The Connect Radio can be powered using the included AC/DC adapter or using a 20V MAX Lithium-ion Craftsman battery (sold separately). 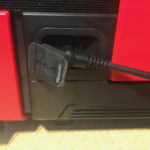 The radio will default to the AC/DC power adapter whenever it is connected to a powered outlet. If a battery is connected while the AC/DC power adapter is plugged in, that battery will charge until it reaches 100%. 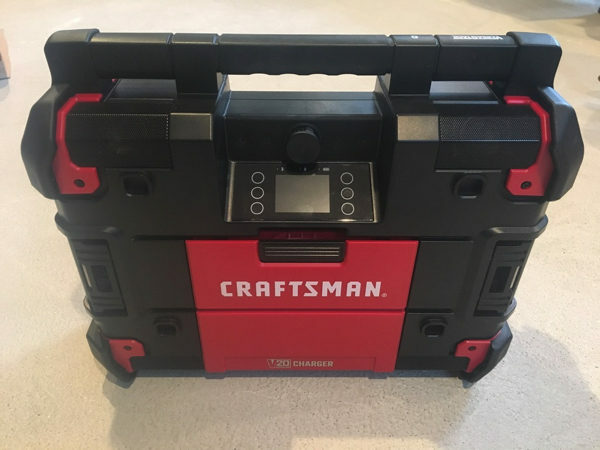 I used a Craftsman 20V Max 2.0Ah Lithium-ion battery for my 3 weeks of testing and it usually powered the Connect Radio for approximately 5.75 – 6.5 hours at varied volume levels using all 3 audio inputs. 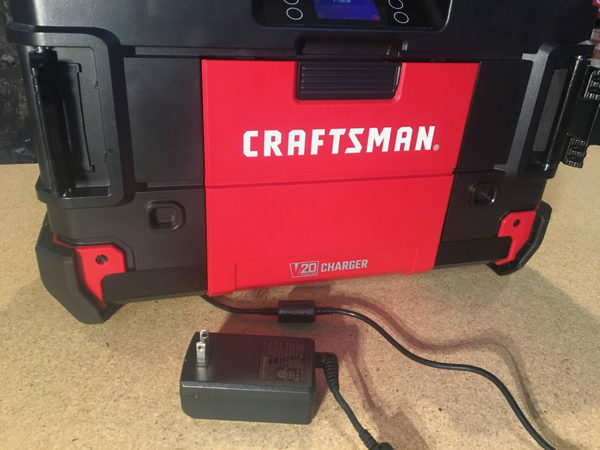 I would have liked a longer battery life from this 20V Max 2.0Ah battery, but Craftsman does estimate a fully charged 20V Max 4.0Ah Lithium-ion battery will run for approximately 9 hours. There is a light on the full-color display that indicates the battery strength, cycling from a green color at full capacity, to amber, and eventually to red when the battery is near empty. A large “empty” battery icon also appears on the screen several times prior to the radio shutting off. 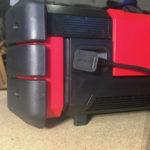 When I needed to fully recharge the battery inside the Connect Radio, it was done quickly, in approximately 1.25 hours. I don’t currently own any other VersaStack tools, but certainly look forward to purchasing some. 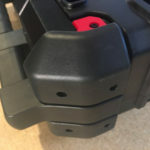 The Connect Radio has 4 feet and two latch locations on the bottom of the unit that would allow it to secure to the top of other VersaStack products. 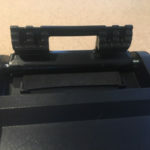 On the top of the Connect Radio there are also 2 stacking latches and 4 indentations if you had a VersaStack unit on top of it. 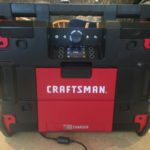 I would love to add the Connect Radio to the Craftsman VersaStack System Tower for added convenience on the job site. 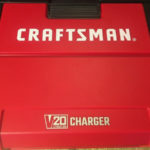 I am very pleased to own the Craftsman VersaStack Connect Radio and Charger. It has more features than any typical work site radio would ever have. Its exterior design is sturdy, it is weather and dust resistant, and it will even protect your smartphone inside its storage compartment. 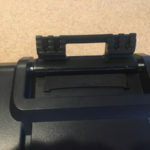 The Bluetooth connectivity was perfect and the App provided convenient single-hand operation. Most importantly, the audio produced by the Connect Radio was astounding from each of the sources that I tested. 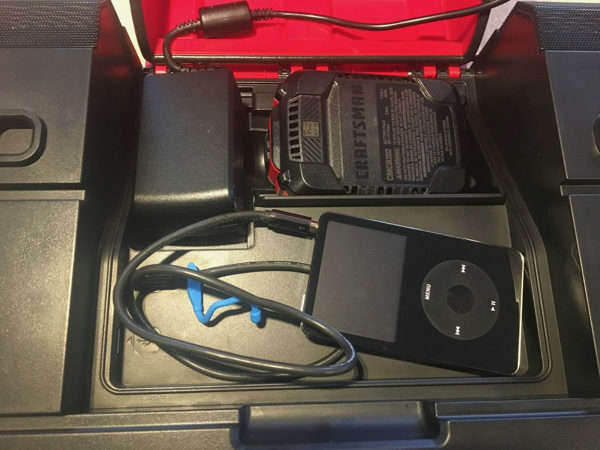 Music lovers will appreciate having this dual-powered radio in their workshop and on the job site. 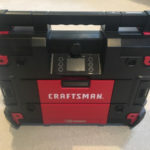 You can purchase The Craftsman VersaStack Connect Radio and Charger at Lowe’s for $189.00. 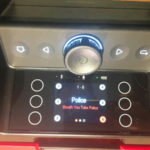 The Connect Radio has a 3-year Limited Warranty and a 1-year Free Service Warranty. John Peachey is a 24-year veteran teacher with a Masters Degree in Instructional Technology. John is passionate about technology and is a big fan of Apple hardware and other techie gadgets. 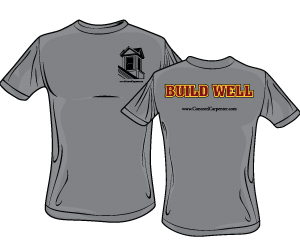 As a homeowner, John enjoys spending time in his workshop and in his yard getting his hands dirty completing DIY projects. For ten years John was the general manager of a swimming and sailing club, responsible for overseeing and maintaining the extensive facilities. In his free time, John enjoys outdoor activities, especially golf, fishing, boating, biking, and camping. John’s love of the outdoors provides him with the time and opportunity to field test and review knives, multi-tools, flashlights, yard tools, and other handy devices. In addition, supporting teachers, students, and friends with technology for more than 20 years has provided him with the experience to advise, evaluate, and integrate technology products into a user’s daily life. Here at A Concord Carpenter, John enjoys reviewing all of these products.